One the Grigoletto Filati’s best seller, are the sets aida towels. Lots colors, great quality 100% made in Italy. But this happens because we usually present our towel sets with different kind of needleworks. It’s true that aida fabric is perfect to be used with cross stitch, but also, aida fabric is a regular fabric and for this reason it is possible to use it for other different styles of needlework. Bargello point, for example. And also, using our Mouliné yarn you may obtain an amazing embroidery, coordinable with your bathroom, or a perfect present for your friend. 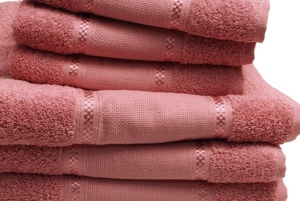 Discover our aida sets towels here. And the Mouliné embroidery yarn here. Pure linen SPOLETO. When it is really important the fabric for your needleworks. Spoleto is a pure linen fabric with a regular construction with 12 threads per centimeter in weft and warp, available cm. 180 wide. Its construction involves the use of long-staple linen yarns, that guarantee fabric strength and extreme texture cleaning, and makes it easy to be embroidered. SPOLETO has, as told, 12 threads per centimeter, so it is perfect to be used for curtains, because it will let to the sunlight to come inside without the possibility to see anyone inside. You also may use SPOLETO to produce tablecloths, offering to your guests, the pleasure of dining on an elegant and precious tablecloth with the important value added by your needleworks on it. So, if you’re looking for an excellent work base, consider SPOLETO. Surely, you will appreciate the difference. You can find SPOLETO pure linen here. Jute is a natural fiber that has different uses in textile but also in other uses, including aeronautics. The fabric that Grigoletto Filati proposes is produced width cm. 280 and it is raw. It has a pretty closed construction, and it’s suitable to produce sacks, carpets, party favors and many other creative articles. 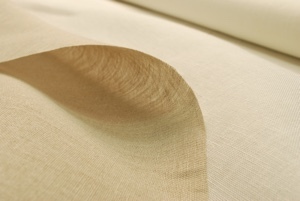 Raw, robust and with the characteristic golden color, this fabric is 100% biodegradable and recyclable. Being a tenacious fiber, not elastic and highly breathable, jute is also very much used for packaging of agricultural products. 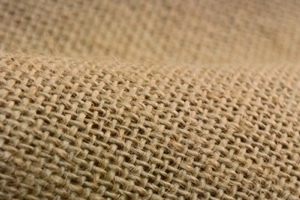 Into our website you can find our jute fabric here. Embroidery thread GIZA Muliné – six strand thread. Embroider in a different way. The GIZA Muliné embroidery thread is an high quality Grigoletto Filati product. 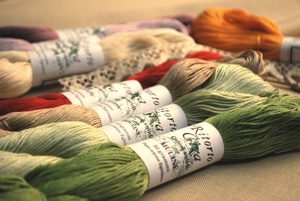 Packaged in skeins of gr. 50, this yarn is perfect for needleworks that require the mouliné thread. The GIZA Mouliné thread is a six strand thread and you may use one or more threads depending on your necessities. The GIZA Mouliné embroidery thread is the result of a careful choice of raw material quality, as well as the finishing and dyeing part. The result is a brilliant, soft and washable product. Choose the color you like, in the full range of colors with over 50 shades available. You can purchase the GIZA Mouliné thread here.